Has undergone Doula UK’s Recognition process with a Doula Mentor, and has been “recognised” as having attained a particular level of learned skills and experience. Works in the UK and meets the HMRC definition of having UK residence. As of January 2016 Doula UK also accepts members from the Channel Islands and the Isle of Man, and from October 2016 Doula UK accepts members from the Republic of Ireland; providing criteria 1-3 above are met. Is willing to engage in Doula UK’s mentoring process in order to become a recognised doula. Will only be able to be listed on the Doula UK “Find a doula” pages once she has a Doula Mentor. 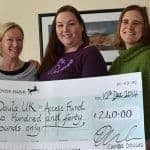 Will advertise herself as a Doula UK mentored doula, offering doula services at a reduced fee (to be discussed and agreed with her mentor) until she has fulfilled the necessary criteria for recognition. As of January 2016 Doula UK also accepts members from the Channel Islands and the Isle of Man, and from October 2016 Doula UK accepts members from the Republic of Ireland; providing criteria 1-5 above are met. Fees for Mentorship are in addition to the usual membership fee. Each birth or postnatal report submitted will cost £40, with a final £40 for the Recognition interview. Would like to remain a part of their Doula UK community. Membership fee is £40 per annum. Please email info@doula.org.uk if you would like to become an Overseas Affiliate Member. Doesn’t fulfil the requirements for other Membership categories. Membership fee is £25 per annum. You can become a Friend of Doula UK straight away here. Get more information on Why Join Doula UK?